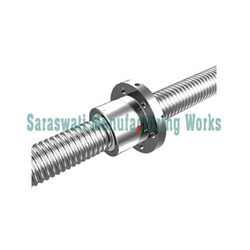 Leading Manufacturer of lead screw, lead screw for car lifting machine, lead screw for warping machine, screw for edge cutting machine and screw for textile machinery from Ahmedabad. Manufactured by updated machinery, and modern technology at our ultra-modern manufacturing unit, we are offering a distinguished range of Stainless Steel Lead Screw. We manufacture the whole range of lead screw by using latest technology and best material in order to meet the industry standards. Also, after manufacturing process this lead screw is gone through a series of tests to make certain that we are presenting a flawless range. These lead screws are provided as per client’s requirement at nominal prices. Our company is extremely engaged in presenting a comprehensive range of Screw for Car Lifting Machine. During manufacturing process, we only use best crude material and advance technology for its permanence and stout construction of our lifting machine. Moreover, we supply the whole range of lifting machines to our patrons after inspecting it properly on a variety of parameters. Our valued patrons can buy the offered range from us at nominal prices. Platform size: 5.3 x 3 Mtrs. Max. Lifting height: 12.8 Mtrs. With our in-depth information and experience we are manufacturing and supplying a wide assortment of Lead Screw. The offered lead screw is perfectly designed by using best crude material and advanced technology with machines in adherence to the market standards. The lead screw provided by us is highly admired by our patrons for its corrosion resistance and high durability. Our patrons can buy the presented range from us in various modified options at nominal prices. With our in-depth information and experience we are manufacturing and supplying a wide assortment of Screw for Warping Machine to our clients. The Warping machines provided by us to our patrons are available in various dimensions and other provision to meet the spotted necessities of the patrons. These Warping machines are design by using best crude material and stylish technology as per market norms. We are alleged manufacturer and suppliers of Screw for Edge Cutting Machine along with the market norms. These Cutting machines are designed by using latest technology and best crude materials under the strict observation of our professionals. Our offered cutting machines are tested on our quality department to make certain these qualities from our side. These cutting machines can also be taken as per clients needs at nominal rates. We are successfully engaged in offering a commendable array of Screw for Textile Machinery. During manufacturing process, we only use best crude material and advance technology for its permanence and stout construction of our textile machinery. Moreover, we supply the whole range of textile machinery to our patrons after inspecting it properly on a variety of parameters. Our valued patrons can buy the offered range from us at market prices. Looking for Lead Screw ?